"I hear Yagher's voice in my head, telling me about skin mages. Interrogation. Torture." A violent encounter at friend's party leaves her reeling and tangled up in a supernatural conflict she never dreamed existed. Her loyalties divided between a red-haired stranger and a charming cop, she must learn to navigate this strange new reality while accepting a past that has been ripped from her memories. Secrets and Skin has not been tagged yet. 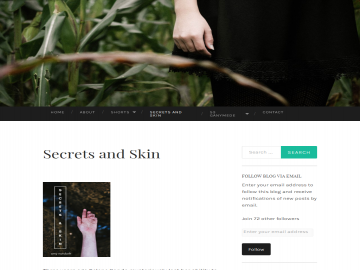 Help others find Secrets and Skin by tagging it! Secrets and Skin has not been reviewed yet. Secrets and Skin has not been recommended yet.